Having completed CSO Insights’ “2017 World-Class Sales and Services Practice” research initiative, where we gathered data from more than 1,200 global study participants on the performance of their sales organizations, I feel compelled to raise a red flag. 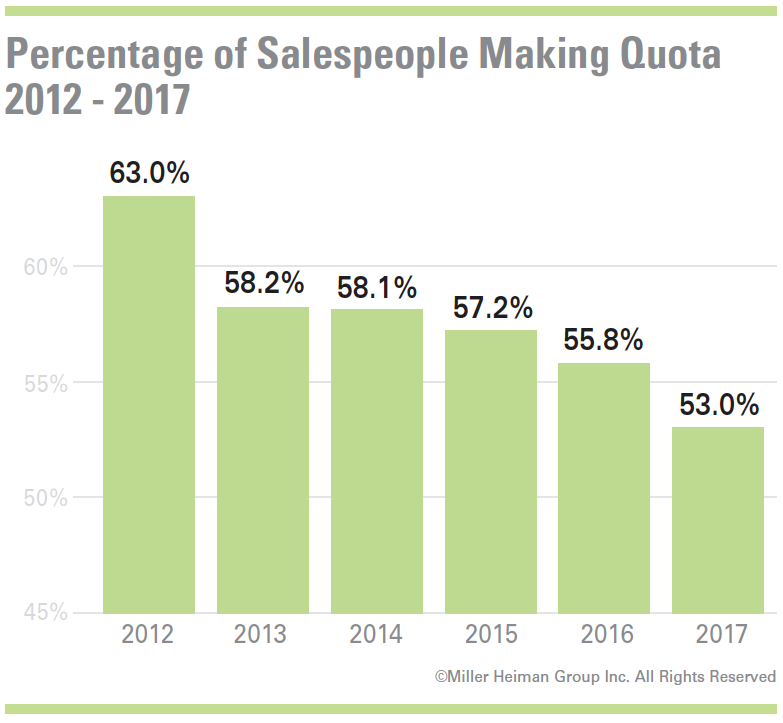 The chart shows the trending over time of a key metric we use to track the health of the sales profession: the percentage of salespeople who are meeting or exceeding quotas. The findings validate what many already suspected: If there was ever a time when selling was easy, now is not it. This significant falloff in performance sends an ominous message not just to sales management—executives should be paying close attention as well. What can be done to reverse this trend? One positive development we are seeing is the emergence of a sales enablement discipline. In 2013, 19.9 percent of the firms we surveyed had established a sales enablement function to focus on increasing sales effectiveness. That number has grown to 45.1 percent. But dedicating personnel to this challenge is not enough; organizations also need to blow up old sales processes and implement fundamentally new ways of engaging and supporting customers. 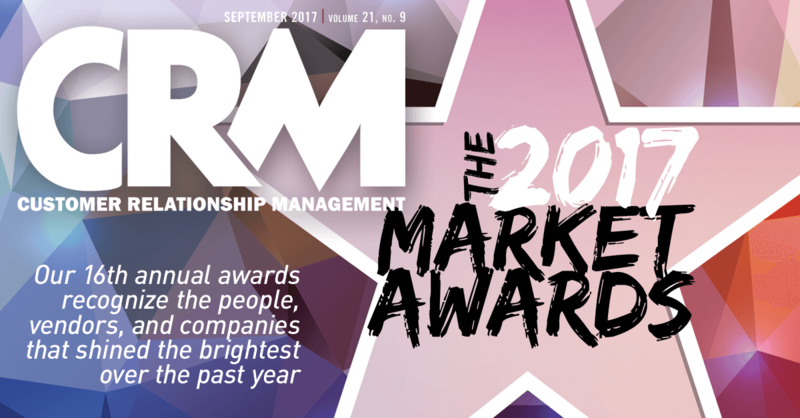 Fortunately, advances in AI-enabled CRM are poised to allow sales enablement teams to do exactly that. The announcement of an alliance between Salesforce.com and IBM generated a lot of attention on what role AI could play in optimizing performance. IBM CEO Ginny Rommety said she sees a business world where “every professional is aided by a cognitive system that augments their expertise.” The combination of Salesforce’s Einstein and IBM Watson lays the groundwork for that to happen for today’s sales organizations. • Manhattan-based Collective[i] is using AI and machine learning innovations to build a community where sales professionals from different companies can tap into knowledge, insights, and best practices used by other sales professionals to optimize their own sales effectiveness. • In San Francisco, Chorus.ai has created a process for seamlessly capturing and analyzing conversations between sales professionals and customers and providing real-time coaching to salespeople on how to engage customers more effectively. • Brainshark, based in Waltham, Mass., has cracked the code for how to use machine learning to instantly assess and score how effective salespeople are at applying new training concepts and strategies, allowing sales managers and trainers to conduct coaching-by-expectation with individuals who need more help. • People.ai, also in the Bay Area, leverages AI to analyze what salespeople are doing during the sales process and surfaces unbiased, metric-based insights into which activities move the ball forward versus those that slow down or derail sales. So, a message to all my sales enablement colleagues: Yes, there are clear challenges ahead, but now we are seeing the rise of technology partners to help you. And based on the chart above, that is happening none too soon. Jim Dickie is an independent research director and the cofounder of CSO Insights, a division of Miller Heiman Group that specializes in benchmarking CRM and sales enablement initiatives. He can be reached at jimdickie@icloud.com or on Twitter @jimdickie.